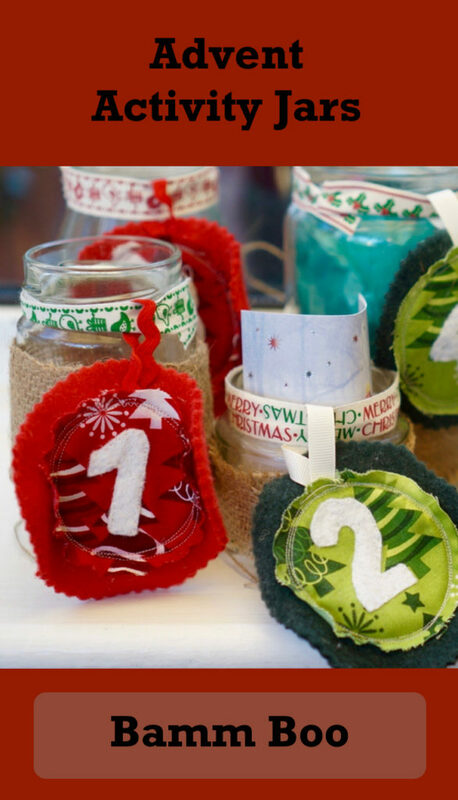 We have used our Advent Activity Jars every year since I first wrote about them in 2011. We even did it last year when we moved into our first (non-rented) house in the middle of December with a 6 month old. I tried to convince E. that we could just buy an advent calendar but he was having none of it. Of course I was secretly happy that he loves it so much. I put little activities, chocolates or gifts in each jar. If the activity doesn’t have any part that will fit in the jar I just write it on an old christmas card. In reality we don’t actually need the jars; envelopes would work fine but they are a cute decoration so they’ve stuck. A few years ago I updated them by stitching numbers onto circles. It took ages so even though I think the circles are a bit too big they’re staying. Gather up any Christmas themed things you already own and spread out giving them back throughout the month. When the decorations get put away I also put away all Christmas books and themed toys. Today’s ‘gift’ was E.’s Christmas Playmobil he got as a present last year. Buy some wrapped chocolates or little toys for the days when you can’t be bothered or haven’t got time. 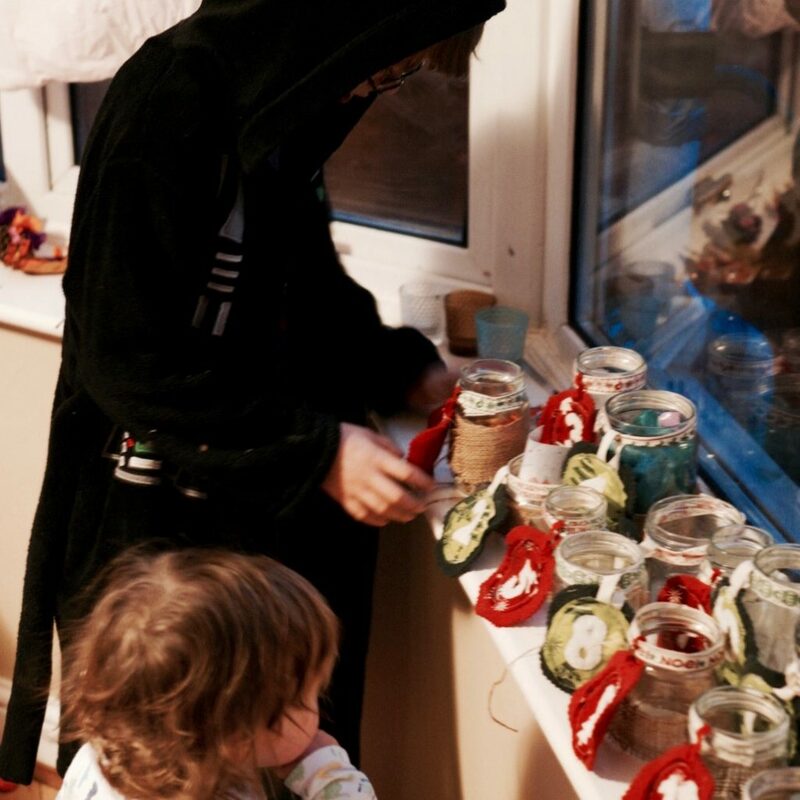 You don’t need to actually get the whole month ready for the 1st of December – most of my jars are currently empty. I try and makes sure I know what I’m doing for a few days ahead but it really isnt necessary to have the whole month planned out. The activities can be basically the same every year. I probably buy a new craft set or two most years but we rarely use the whole set up in one go so they come out again and again. 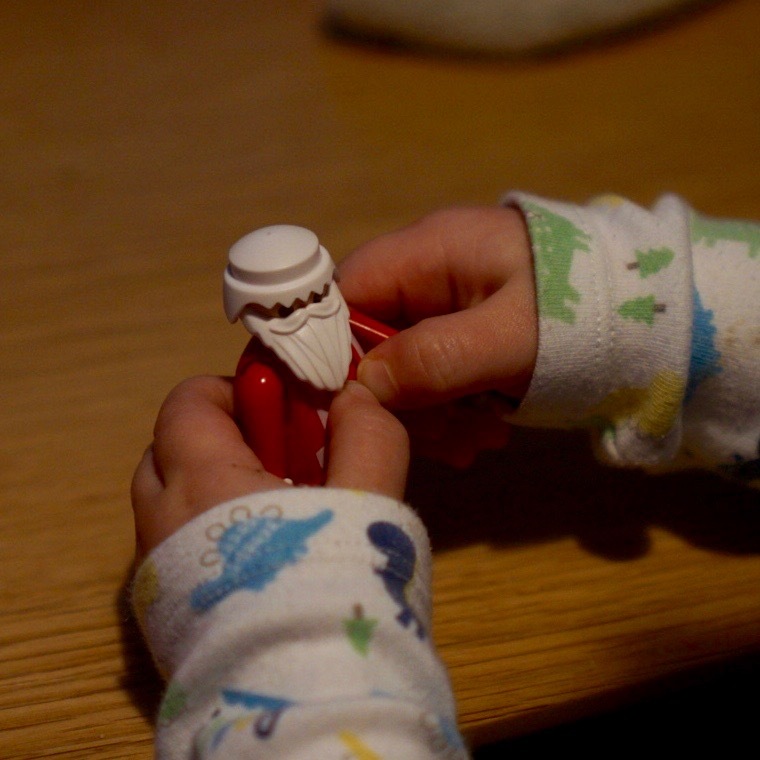 It definitely gets easier – the first year I bought quite a lot of little toys to bulk it out but this year I’m fairly confident we can get by without them! I’m going to post mini updates of what we’ve done each day on Instagram and Facebook and there’s Pinterest board for this year’s activities. I’ll probably post round-ups on here. So do keep checking back if you’re looking for ideas. What a lovely idea. Also a great way of spending time together too.